They sailed almost immediately for Australia. The journey was arduous and long and the young bride was very seasick. Having been advised by well-meaning friends that oranges would help her, she indulged greatly in these to no avail. The combination of oranges and seasickness left an ever-enduring impression on her mind with the result that never to the end of her days would she again touch an orange and later, when her husband mooted the idea of a trip home, she turned him down unhesitatingly. Next were Ellen’s parents – Robert Houliston and his wife Alice Wright. They left behind their home at “Dovecothall” in Berwickshire Scotland, and along Ellen’s 8 siblings, and a baby child of Agnes, Ellen’s oldest sister, set sail for New Zealand in June 1860 on board the ship “Robert Henderson“. Their challenge was also immense, but was probably helped by the fact that Ellen and William was in Australia, and would join them in New Zealand less than 2 years later. Along the way baby Helen, 9 month old daughter of (unmarried) Agnes Houliston died, and was buried at sea. Later during the voyage, scarlet fever broke out onboard and 4 more passengers died. 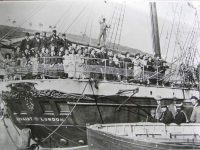 On arrival in Otago, New Zealand, the ship was put into quarantine before the passengers were allowed ashore to end their journey. A painting by R P MacGoun shows 2 ships at Port Chalmers in 1861. Alexander Bringans, his wife Janet Mitchell, and daughter Bethia Bringans sailed from Glasgow, Scotland, to Otago, New Zealand on the ship “Pladda” in 1860. They were among the 371 immigrants on this voyage of the Pladda. 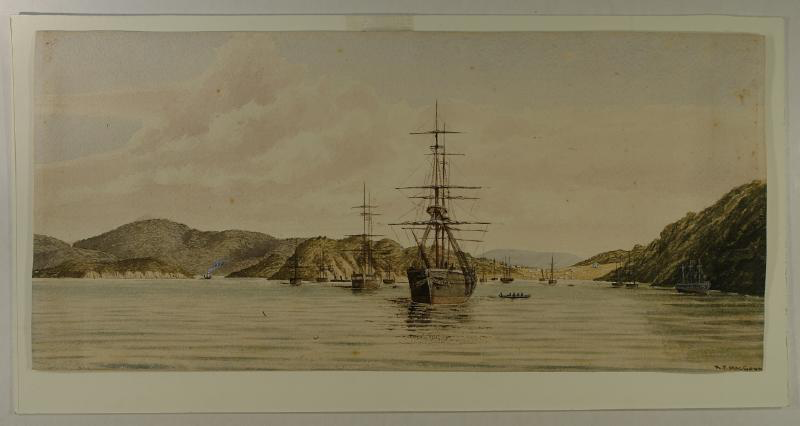 The image on this page shows the two aforementioned ships – Pladda and Robert Henderson in port in Otago at the same time in 1861. 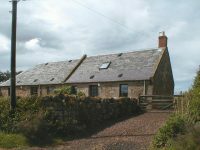 Bethia Bringans married John Dewar – a merchant seaman from Culross, Fife, Scotland, who had sailed to Australia, and then on to New Zealand in 1862. His arrival in New Zealand has not been found yet, nor has the arrival of William Moffat and Ellen Houliston from Victoria, Australia to Otago been found. An image taken in Nelson on the day in 1874 that the Adamant arrived in Nelson. Mum’s ancestors were later arrivals in New Zealand than Dad’s ancestors. Of Mum’s 4 grandparents, 3 of them – Alfred Lineham, Fanny Lansberry, and James Scarlett with his parents Daniel Scarlett and Harriet Cato, arrived on the ship “Adamant” which sailed from London, England on 6 May 1874 and arrived in Nelson, New Zealand 3 months later on 8 August 1874. 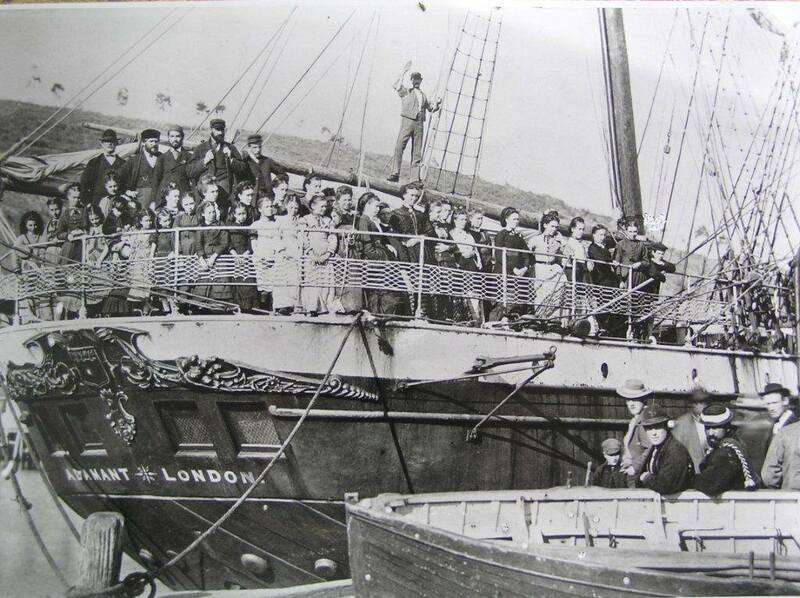 14 of the families on this voyage then travelled to the northern west coast of New Zealand to become the pioneer founders of Karamea as detailed in the book The Farthest Promised Land by Rollo Arnold and published by Victoria University Press in 1981. The ship’s passenger list available here on FamilySearch.org show the families that made this trip, including on the later pages of the book how much the fares were. The last challenge that arises is to me – to try and find out more about the ancestors I haven’t found in shipping lists yet – John Dewar, Peter Mulvay and Betty Oliver (the parents of Mary Mulvay who married James Scarlett), as well as get some of the new information I’ve found researching this posting into my genealogy database. Oh well, next week is another week – and another 52 Ancestors in 52 Weeks challenge.